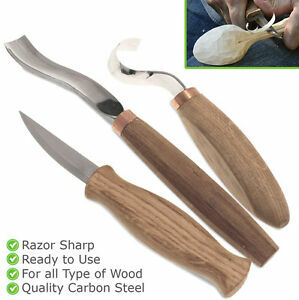 Whittling knife opinion and wood supplier? I use the knife on the bottom. In fact it’s the only hand tool I have, but it works SO well and looks just right whilst sitting in the shade whittling a branch into something. (I’m the guy what dresses as a 1700’s pirate at WDW). I also need a good supplier for various wood stock to hand carve. I used to have a cherry tree and really enjoyed the density and color. Any suggestions? Ikyoto – I don’t go to WDW – welcome aboard, neighbor !! Helvie makes a huge variety of carving knives with various handles shapes from different materials and blade shapes in different sizes and thicknesses. And you can also get any handle unfinished and without a logo. Heinecke is a good source of basswood. Not sure exactly what you are wanting to carve. I am assuming you are talking about Walt Disney World in Kissimmee/Orlando ?? Helvie: http://helvieknives.com I own several of these as well and can give them a high recommendation. Heinecke: http://www.heineckewood.com/ Prime Northern basswood; I buy all my basswood from these people. I mostly use the Morakniv sloyd knives, which look a lot like your third one. They make both wooden-handled versions for a little over $20, as well as a plastic-handled one that’s targeted at kids, but also works real well for carrying everywhere and banging around. As long as it’s in the plastic sheath they also provide, it’s nearly indestructible, and retails for about $15. The logo is on the metal of the blade, but you could remove it with a grinder or sharpening stone in minutes. Last time I ordered directly from them, I received my knives (from Sweden) in under a week. I really like Morakniv Frost knives as well. I admittedly don’t have a lot of experience with other brands but I’m totally happy with the steel, shape and bevel of their sloyd. I have one of their spoon knives w/the double bevel which I find harder to sharpen…(smaller bevel to keep flat) but the steel is still great – especially for the price.